I heard that the weather affects cat behavior, Thomasina. Is that true? Good question! The weather definitely affects cat behavior. It certainly affects mine. Now that the days are getting shorter, I feel like I want to eat nonstop! 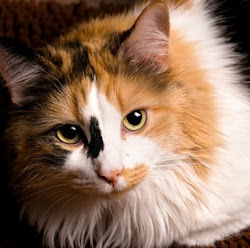 One way cold weather affects cat behavior is that we have to eat more because we need extra energy to keep warm. That's as true of cats who stay inside all the time as it is of cats who go out or live outside. My human typist found this and thought it was interesting. Some researchers at the University of Liverpool's School of Veterinary Science studied how much 38 cats ate at different times of the year. They found that the cats ate the most between October and February. In the summer, the cats ate 15 per cent less. I could have told them that! Although the cats ate more in the winter, they didn't gain weight. The researchers theorize (how do you like that word? My human typist came up with it.) that we have different energy requirements at different times of the year. I could have told them that, too! In the winter, we need energy to keep warm. In the summer, we rest so we don't overheat. This isn't exactly cat behavior, but did you know cats who go out shed in both the spring and fall? We shed our summer coats in the fall to make room for the heavier fur we'll need during the winter. Cats who live strictly indoors shed all year, maybe because their bodies don't know what season it is. 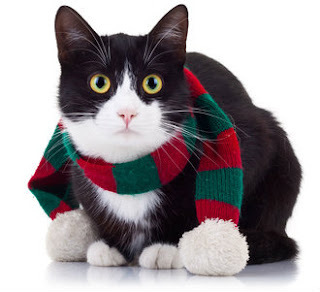 Colder weather affects cat behavior in a few ways. As the days get shorter and colder, many of us like to spend more time inside. And our favorite place to nap might change to a warmer, sunnier location. When my friend Soda's inside, he likes to sleep in a basket on our human's dresser under a sunny window. He never sleeps there when it's warm outside! The dark, cold days of winter can make cats depressed, too. With no leaves to chase and very few birds to watch, outside can be really boring. And inside, there's nothing for most cats to do but eat and sleep. You can make indoor life more interesting for your cats by leaving some blinds and curtains open so they can see outside and spending some time playing with them with a wand or fishing pole toy. Exercise cheers everyone up. Our human leaves the TV on for us, too. But Animal Planet can be too scary. We like the shopping channels because the humans move around a lot, and they're sort of fun to watch. Hot weather affects our behavior, too. We rest more during the day and are most active at night. Did you know this? Humid days are the worst. We don't perspire (thanks for the polite word, human typist!) the way people do. And we don't pant like dogs do, unless we're in real distress. Cats cool off by licking their fur. Quoting the Oven Baked Tradition website, "When it's humid, the air is already packed with water, leaving no room for extra water from the body." Ugh... that explains why we're miserable and don't feel like doing anything on very humid days. Did you know your cats can help you forecast the weather? If your indoor cats are afraid of thunder and suddenly disappear under the bed, or if your outdoor cat is pounding on the door begging to come in, you can be pretty sure it's going to rain. Experts think we sense changes in the barometric pressure, or notice changes in the bioelectric field or shifts in ionization. I have no idea what any of that means. But I do know I feel different when a storm is coming, and I can smell the rain from miles away. Some cats love to play in the rain, but I'm scared of it. And it turns my long fur into a tangled mess. When I feel a storm coming, I head for home as fast as I can. And that's how rainy weather affects this cat's behavior! I hope this answers your question, Curious. And if you'd like to read more about how the weather affects cat behavior, here are some links. How Do Cats Cope With Cold Weather?